The Handmaid’s Tale is a critically acclaimed television series, based on a dystopian novel by author Margaret Atwood, about a near-future when the continental United States has been taken over by an extremist totalitarian regime. The show has won over a dozen awards, including multiple Emmys and Golden Globes, and has thrilled audiences around the world with its signature disturbingly plausible vision of the future. 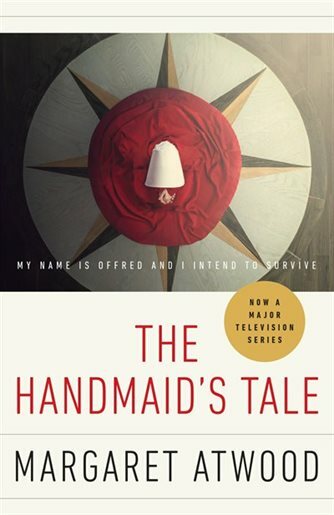 The Hulu series and original novel by Margaret Atwood are set in North America, but in this twisted dystopia, it is easy to forget the characters are still in what would be the former U.S. Since the original novel’s release in 1986, numerous maps have been created in an attempt to understand what’s really going on in this dystopian world. 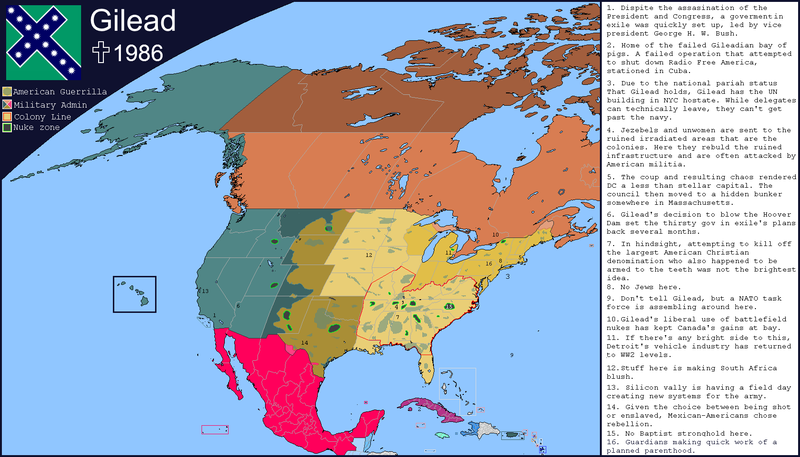 This map comes from Alternate History, a website that theorizes about what the world would look like if events in history happened differently. The map is based primarily on the book rather than the television series, but so far the series has remained, for the most part, geographically true to Ms. Atwood’s work. On this map, Canada and Mexico both remain independent, and the Western U.S., Alaska, and Hawaii all remain free from Gilead. The Southeastern U.S. has been designated “the Colonies,” and is shown here as being riddled with pockets of nuclear radiation. We can see here that Gilead’s influence is strongest in the Northeast, with former Massachusetts serving as the new Gilead capital, since DC was destroyed. The numeric list on the right points out major details, mentioning baptist rebellion forces in the south and Mexican-American forces in southern Texas. It also mentions many events that the show has yet to mention. Fear not however, the descriptions are intentionally vague and shouldn’t spoil too much. In The Handmaid’s Tale, the world is suffering a crisis in which fertility rates have dropped, and women have suddenly become infertile. An extremist group called the Sons of Jacob, who adhere to a twisted and cruel interpretation of the Old Testament, use this chaos and uncertainty to launch a series of terrorist attacks on the American government, taking over the Northeastern United States and eventually the rest of the country. The series begins after this takeover, somewhere near former Boston in the new nation of Gilead, which is ruled by a council of Commanders. Gilead oppresses women, using mass infertility as a justification for the subjugation of women, forcing certain women to be ‘Handmaids’ and bear children against their will for the Commanders and their wives. In general, it is illegal for women to read or write, drive, disobey men, use the money, or be anything besides a wife, handmaid, or housekeeper (a ‘Martha’). Rulebreakers and women deemed unfit for the new society are either executed or exiled to the “colonies” where they are worked to death cleaning up radioactive waste. Somewhat intentionally, the viewer is kept unaware of the actual geographic setup of Gilead. 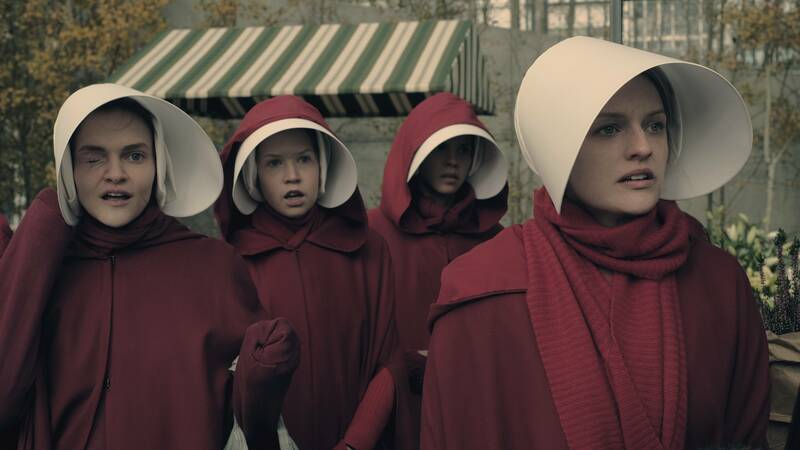 The show revolves around Offred (Elisabeth Moss), a young woman forced to be a handmaid for a powerful Commander with little knowledge of what is going on outside of what she is allowed to know. The show hints at what’s happening around Gilead. In season 1, there are mentions of “fighting in Florida,” and of rebel forces in “the remains of Chicago.” In season 2, we learn more about the geography of Gilead – Canada is still independent and is taking in refugees from the former U.S., and that the U.S. is still in control of Alaska and Hawaii. Colonies seem to be somewhere in the former southeastern U.S.. Viewers also learn that there are pockets of rebellions all around Gilead; the original book goes further into this subject. However, the true geography of Gilead remains a mystery to fans. The Handmaid’s Tale is a fascinating example of an alternative world and the way that maps can help us visualize ideas far beyond numbers and data.